Spreadsheets are a great lightweight databases. Google Spreadsheets in particular are easy to work with and share, making this unlike most traditional database setups. That being said, traditional databases are great for bigger, more secure jobs. If you're storing lots and lots and lots of information, or storing sensitive or complex information—the spreadsheet is not for you. But if you're working on small to medium sized personal or community projects, try a spreadsheet! 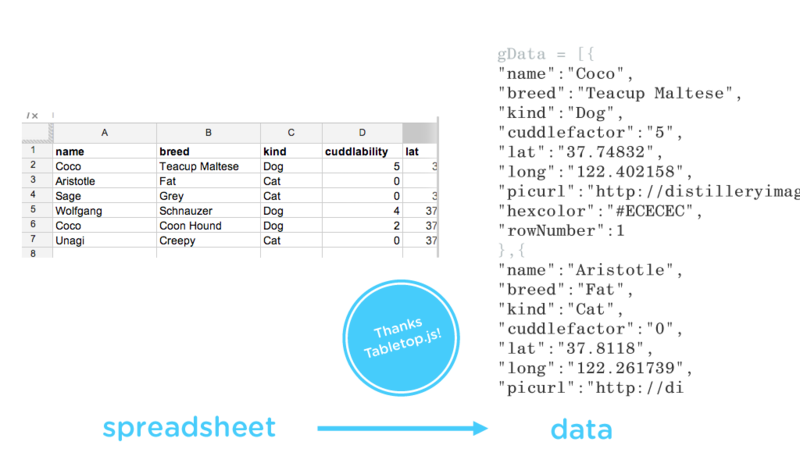 Link to Sheetsee.js and Tabletop.js in your HTML head. Link to sheetsee's default stylesheet, sss.css. Create a place holder <div>, with id, in your HTML the map or table you want. Create templates for tables in <script> tags with an id matching the <div> plus _template. Inside of another <script> tag initialize Tabletop.js. Once it fetches your spreadsheet data, pass it onto Sheetsee. Define the function that Tabletop.js calls when it returns with the data. This function will contain all the Sheetsee.js methods you want to use. // All the Sheetsee things you want to do! Set it and forget. Now all you need to do is edit the spreadsheet and visitors will get the latest information every time they load the page. // template if you so desire! Your Google Spreadsheet should be set up with row one as your column headers. Row two and beyond should be your data. Each header and row becomes an object in the final array that Tabletop.js delivers of your data. There shouldn't be any breaks or horizontal organization in the spreadsheet. 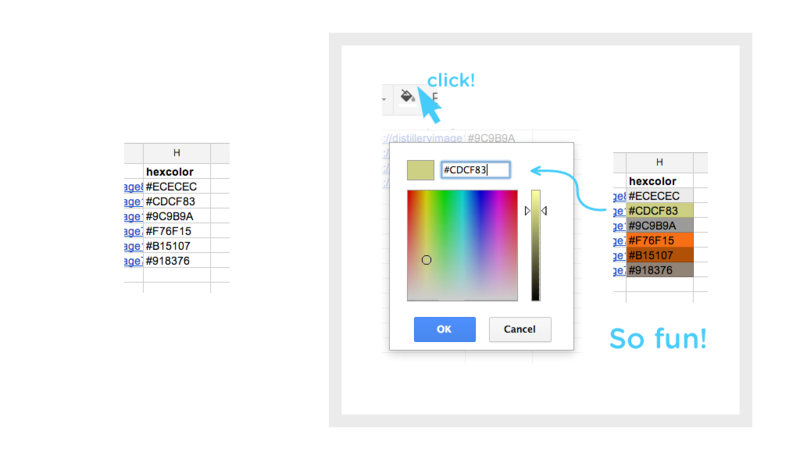 But, feel free to format the style of your spreadsheet as you wish; borders, fonts and colors and such do not transfer or affect your data exporting. You can add a column to your spreadsheet with the heading hexcolor (case insensitive) and add colors to be used in maps. The color scheme is up to you, all you need to do is fill the column with hexidecimal color values. This color picker by Devin Hunt is really nice. #Funtip: Coloring the background of the cell it's hexcolor brings delight! If you intend to map your data and only have addresses you'll need to geocode the addresses into lat/long coordinates. Mapbox built a plugin that does this for you in Google Docs. You can also use websites like latlong.net to get the coordinates and paste them into rows with column headers lat and long. You need to do this in order to generate a unique key for your spreadsheet, which Tabletop.js will use to get your spreadsheet data. In your Google Spreadsheet, click File > Publish to the Web. Then in the next window click Start Publishing; it will then turn into a Stop Publishing button. Sheetsee.js comes with a bare minimum stylesheet, sss.css, which contains elements you'll want to style when using the feature they correspond to. Use it if you want, or as a starting off point to create your own styles.